Some of us have more rest days than we care to admit. Others of us struggle with actually taking the days off we need to restore and regenerate. I fall in the second category. As I stated in this video, I typically take my daughter to the bus, hit up an endurance workout, drive home, sneak in a bite, and unroll the mat (after I’ve digested). But there are days that I take off from training, and on those days when I unroll the mat, I need to keep it easy. Easier said than done, for me. So, I designed this segment so that it would be a great flow for first thing in the morning or on your days off when you still want to get your body moving, but not with anything too strenuous. I start us off with spinal rolling to warm up the body and soften the form. Twists are great way to jumpstart the digestion process. After sleeping and going into an inevitable and automatic fasting mode, this is a great way to ignite proper digestion and move along anything stagnant. I add in circles to get the shoulders opening first thing, as well. Enjoy the slow walk up to the top of the mat. Consider this exercise a moving meditation. It will help to open the hips and hamstrings. Side stretching is such an important thing to do, as well. Honestly there are days when I forget to do it and I can’t say how important it is. Keeping an open rib cage helps with breathing. 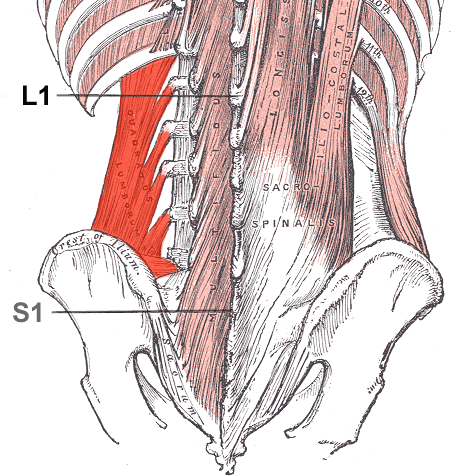 One of the other muscles side stretching opens is the quadratus lumborum, or QL (in red, to the right). This muscle helps keeps the low back healthy, so it should not be forgotten. From there, I move into a few more twists just to get the body started. Think about twists as a physical manifestation of looking at life in a different direction - nothing like a new day to really take on that shape. At the end of the segment I throw in one crazy bonus pose - peacock pose. Peacock pose is a great pose for digestion and I didn’t think a morning session or recovery day would be complete without it. I offered up different variations to make is much easier on the body. And seriously, a peacock is such a regal bird. What a great animal to imitate first thing in the morning. Strut your stuff in those pajamas! Image modified by Uwe Gille (Gray Image:Gray389.png) [Public domain], via Wikimedia Commons.